The news came less than a week into our time as EAs: “The police are here, the village is surrounded, you must come at once”. 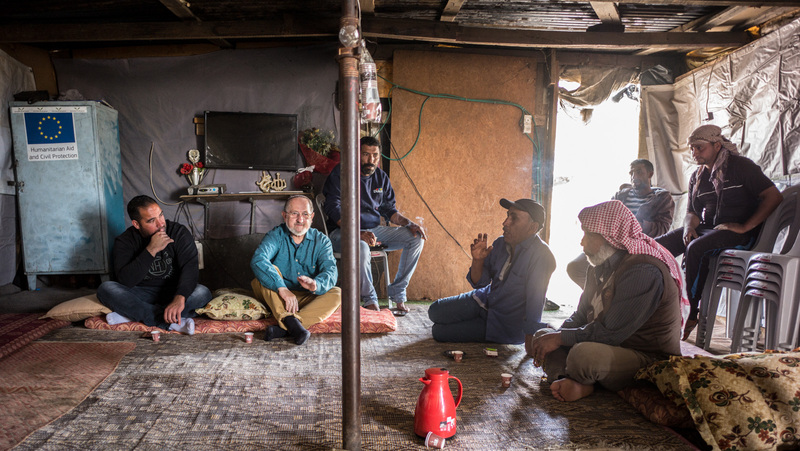 We rushed to the village of Khan al-Ahmar, nestled in the hills on the road between Jerusalem and Jericho, arriving shortly after the departure of Israeli officials and security forces. GPS coordinates had been taken of every structure: homes for people and animals; the mosque; and the school made entirely of tires. This video shows the flimsy pieces of paper attached to each structure. Blowing in the wind, these innocuous papers declare the buildings illegal, and order their demolition. Demolitions of Palestinian homes by the Israeli government are nothing new, but the demolition of an entire village is becoming more common, as EAs have reported previously at Susya and Khirbet Tana. 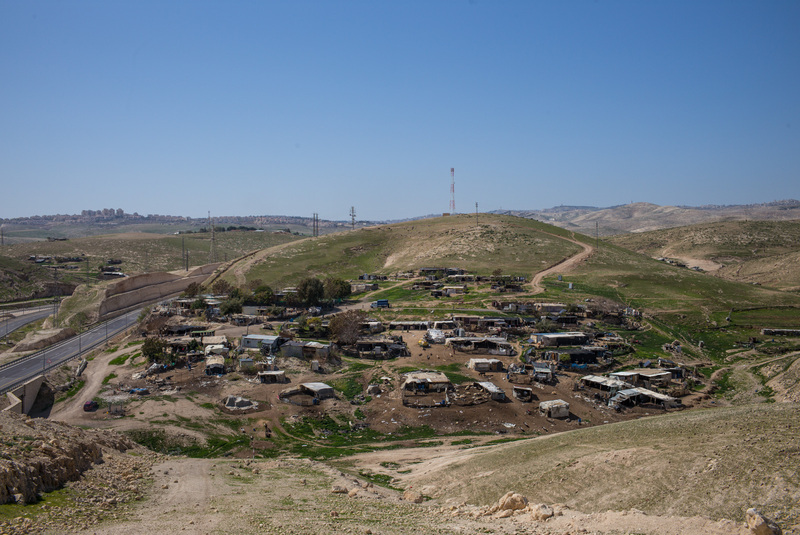 In 2012, the Israeli government announced plans to use the E1 area (which encompasses Khan al-Ahmar) for the expansion of Ma’ale Adumim settlement, home to around 40,000 Israelis. Although now well established, and looking like any modern residential area, the settlement is illegal under international law. The plans for E1 also include the extension of the separation barrier around Ma’ale Adumim, linking it with Israeli territory. E1 is located in the narrowest part of the West Bank, so this development will further restrict Palestinian movement through the corridor that connects the southern and northern West Bank, posing a serious threat to the contiguity of the Palestinian territory. To achieve these plans, the Israeli government has ordered the demolition of Palestinian homes in the area, like those in Khan al-Ahmar. People from the village have been assigned a small plot of land in the Jericho area. For the Jahalin Bedouin tribe living in Khan al-Ahmar and the surrounding villages, forced displacement is nothing new. Their once-nomadic grandparents were transferred to their current location from the Negev Desert following the establishment of the state of Israel in 1948. At one point the demolition of the village seemed imminent and inevitable. A 21-year-old resident told me that, although she had been brought up with the possibility of her home being demolished, this most recent set of demolition orders “made it seem real”. But at the time of writing, more than two months later, Khan a-Ahmar is still standing. The pressure on the community is immense. As EAs we have waited with residents, moving from court date to court date with bated breath, as their lawyer battles through injunctions and petitions in the Israeli Supreme Court. Villagers take each day as it comes, having a bag packed with money, identity cards and school certificates ready for evacuation at a minute’s notice. One woman told us that the perpetual uncertainty means they are just “cooking, cleaning and eating” rather than making long term plans, or improvements to their homes. In the approach to wedding season, the lack of such plans is notable. Meanwhile the people are watched by drones, the school teacher has reported a dramatic fall in school results, and mothers tell us their children wet the bed and jump every time vehicles arrive. In a meeting about Khan al-Ahmar, a UN representative highlighted the coercive environment in which the residents are living. Even if they are not physically forced to leave their homes, an apparent ‘choice’ to leave the village would amount to forcible transfer, a contravention of the Geneva Conventions. But the community is staying, and the villagers’ hope and resilience has inspired the international community. The daughter of the village leader told me that she felt that the international presence, along with pressure at the international level, was helping “change the way people think”. The Israeli government no longer feels it can act with impunity, and the people of Khan al-Ahmar feel supported in their struggle. The people of Khan al-Ahmar request that they are not forgotten by the international community when their story is no longer under the media spotlight. We must maintain pressure on the Israeli government to reverse the demolition orders. Share this blog post with your contacts. 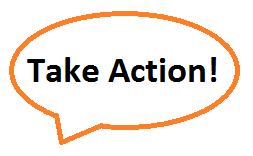 Urge your elected representatives to maintain their support of the Jahalin Bedouin in the Jordan Valley. This includes continuing to raise the issue in parliament, and encouraging delegations to visit the community to show their support and learn more about the situation. 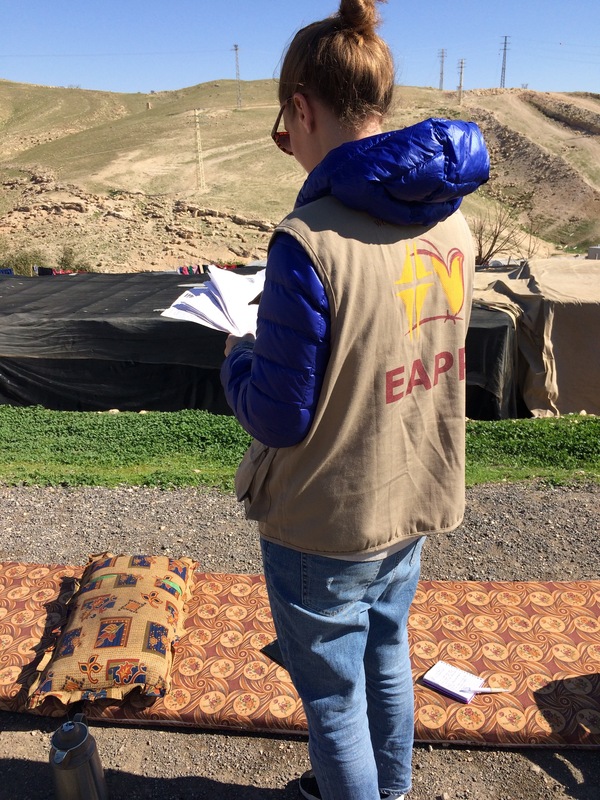 Support local activists working in Khan al-Ahmar, for example B’Tselem and Vento di Terra. Learn more about the Jahalin community living east of Jerusalem in this short film. This entry was posted in Demolitions and forced displacement, East Jerusalem, Settlements. Bookmark the permalink.